Mixing it up and moving to Portland! I’m back! Sorry everyone for the short hiatus from posting. I recently took a new job in Portland, Oregon and have been crazy busy with the transition. Last week I moved north to the big city into a studio apartment – man did I have to downsize my stuff! It’s amazing how much crud you can accumulate in a few years, but the purge felt good…real good! After a few days as a new, very lost & lonely urbanite, I am finally settling in or I have at least found the grocery store, set up internet and a located good place for a run and a cold drink. 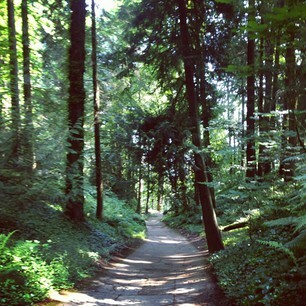 Here is a photo from my first run through Washington Park. I think I’m going to like it here! With this big change, you can expect new posts and photos about my explorations around this northern region of Oregon and maybe even more from Washington as well. But no worries, I will still be hiking, running & traveling to show off this beautiful state that I call home! Best wishes with your new job and living in Portland. It’s a beautiful city. Much to do for an outdoors person like you.